Tribute Games is one of the hottest up-and-coming indie developers in recent years thanks to their most recent games -- Mercenary Kings, and last year's fast-paced roguelike, Flinthook. And now, thanks to Limited Run Games, you'll have the chance to buy physical versions of both games for the Nintendo Switch. Pre-orders have officially opened today (April 23) and will run until May 7 at 11:59 pm ET. The games will cost $29.99 each (hey, those Switch carts aren't cheap!) and will feature reversible covers and full-color manuals. Not bad! The Tribute Treasure Box is being limited to 3,000 copies worldwide, so if you're interested in it, you'll have just one more opportunity to preorder it. While the first allotment has sold out, it will be available again later today (April 23) at 6pm ET; at the time of this writing, that's less than two hours away, so you'll need to act quick. Last but not least, Marcus reviewed Mercenary Kings here when it originally released on PC back in 2014, so if you're interested in finding out more about that game, check out his thoughts by clicking here. 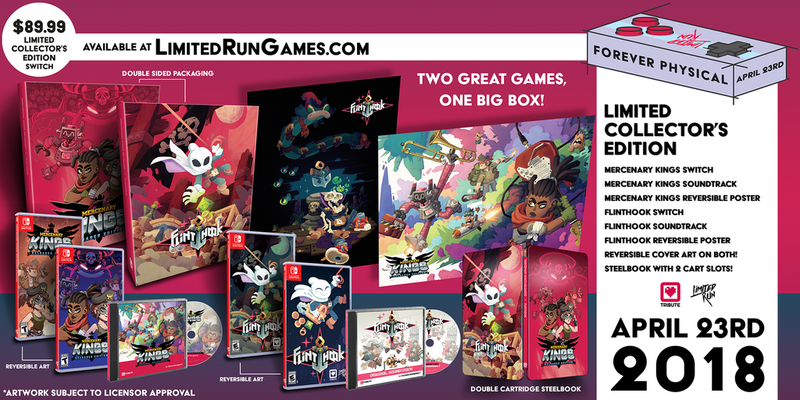 Will you be preordering the Limited Run releases of Flinthook and/or Mercenary Kings? If I didn't already have both of these (not for Switch, but still) I'd probably jump on them, or at least Flinthook. I can't think of any other digital Switch games (that, again, I don't already have) that I'd want to get this treatment, but I'm sure something will come up sooner or later and I'll be happy to be able to hold it in my arms.